"Community Matters" - "Current Events, for Better or Worse" OPEN MIKE SHOW (see: current articles) ~~ Bring your experience and opinions. Tonight we'll discuss the news of the previous week. Every day on the LACP web site we carry a 'Daily Digest' of current news, often from Americas most recognized sources. We scour the obvious newspapers and cable news organizations, but also include articles that appear on noted activist, social media and official government web sites. You'll find crime stories, resources and OPINION pieces on regional, national and International topics. Compiled on a single 'News of the Week' page, and archived year after year, the information we offer the community-based policing activist is enormous .. and growing all the time. LACP volunteers work hard, every day, to deliver our followers a variety of items relevant to keep them up-to-date with what's happening in law enforcement, government and community policing circles. ~~ Bill Murray, our host, is also the well-respected community voice of public safety, violence prevention and a leader in anti-child abuse and trauma efforts. His significant circle of influence includes his work as the founder of both LA Community Policing (LACP.org) and the National Association of Adult Survivors of Child Abuse (NAASCA.org). ~~ "Where is the UNITY in 'community' these days?," Bill asks. "Unless we can learn to set aside our differences and start paying attention to how shockingly similar our experiences, feelings and actions are we'll not make progress." 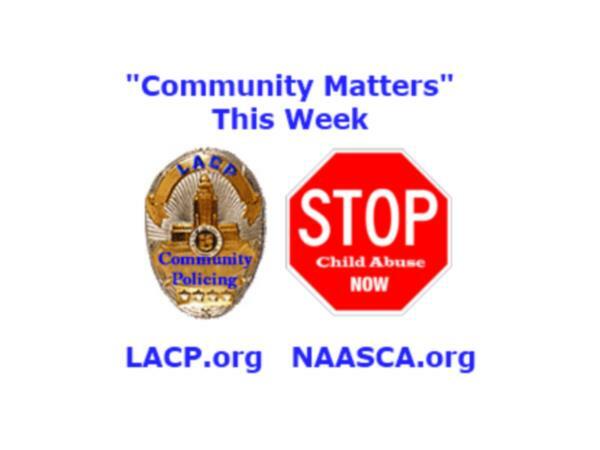 CHECK OUT the new Facebook page: LACP - Community Policing at www.Facebook.com/LACP.org.